Recycled Natural Kraft Paper Shopping Bags, 10" x 7" x 12"
Recycled White Kraft Paper Shopping Bags, 10" x 7" x 12"
Recycled White Kraft Paper Shopping Bags, 6-1/2" x 3-1/2" x 12-3/8"
Dimensions: 6-1/2" x 3-1/2" x 12-3/8"
Recycled White Kraft Paper Shopping Bags, 14-1/2" x 9-1/2" x 16-1/4"
Dimensions: 14-1/2" x 9-1/2" x 16-1/4"
Recycled White Paper Shopping Bags, 13" x 7" x 17-1/2"
Dimensions: 13" x 7" x 17-1/2"
Recycled Natural Kraft Paper Shopping Bags, 8" x 4.75" x 13-5/8"
Dimensions: 8" x 4.75" x 13-5/8"
If you're looking for an environmentally conscious solution for your paper bags, these Recycled Natural Kraft bags are the perfect option. Each of these paper bags is 100% recycled, and the White Recycled Shopping Bags are made with 90% Post Consumer Content & 10% Post-Industrial Fibers. We also have recycled economy options for the budget conscience buyer that are made with 60-65# weight paper. The economy shoppers have a straight edge top while the stock line has a serrated edge top. All bags come with twisted paper handles and are packaged 250 bags to the case unless otherwise noted. How do you size a paper bag to be sure it will fit your items? All sizing is listed in the following way â€“ The first number represents the width of the bag from side to side, the next number is the depth of the gusset (sides) of the bag and the bottom measurement, lastly the end number is the height of the bag. All paper shopping bags should sit flat on their bottom when opened for easy loading of products. 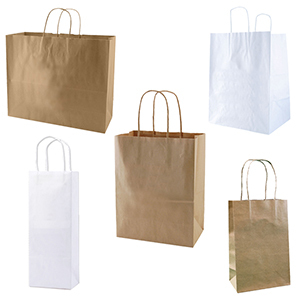 American Retail Supply carries bags in all the industries popular sizes from Gem to Jumbo Shoppers. Donâ€™t forget to add a logo to your Recycled Kraft Paper Bag. We can post print in ink or hot-stamp foil on these bags, so they are ready to use when they arrive. You can have labels printed and affix them to the bags as you use them. Offering your customers an attractive and function way to carry their purchases is fundamental to the success of your business, we are here to assist you with tips and methods to do that within your budget and aesthetic.